Fresh Mama Fitness and Health: Jalapeno Cheddar Burgers + Core de Force! Here we goooo!!!! Jalapeno Cheddar Burgers + Core de Force! Here we goooo!!!! By now you guys know its always about the fooood for me - and I'm here to tell you Core de Force (my new workout program), is all about the food! Yes, of course the workouts are a blast and effective - but our results are entirely dependent on fueling our bodies with healthy food and sticking to the plan. Today's post features these heavenly Jalepeno Cheddar Burgers from the Core de Force official Eating Plan - of course I tweaked them, but only a teeny-tiny bit, so I cannot take credit for these! First of all - these "before" photos don't really feel like before photos. This past year has been a huge journey and last year this time was a huge downward spiral for me, emotionally. For many of us the holidays are a mix of the magic of the season, sprinkled in with reminders of people we've lost and sadness. In addition to the holiday madness, our family celebrates many birthdays (including mine) in the month of December - and last year was a colossal bag of craziness in my head. I let my eating get out of control and by the time the New Year hit, I was a hot mess. 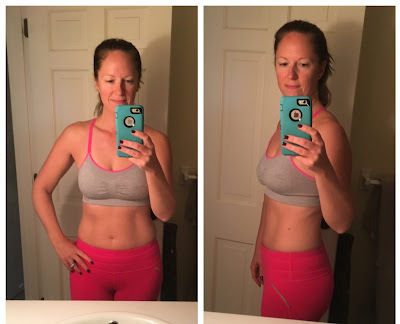 So, this year - I took one look at my "before" photos from January (and when I started the Hammer and Chisel program) and determination struck that I wouldn't go back to that. Ever. I'll admit, I was skeptical of Core de Force - cardio is not my jam and although, I took kickboxing classes at my gym in the past, it was never my "thing". But, let me tell you - one workout in and I was hooked! It's like nothing I've ever done before - so perhaps that's why I love it so much! This video gives you a little idea of why its so much fun and why the ladies in my group are looking forward to our workouts each day! Now, 2 weeks in - I'm feeling stronger, already seeing results and I'm excited to share this journey with you guys! Here's just a few samples of the food I'm eating - so far the biggest surprise was this zucchini lasagna - when the pasta-loving hub declares "This is awesome!" you know you have a winner. I'll be sharing all these recipes, but today -let's get started with these awesome burgers! I doubled the recipe for leftovers, but you could cut it in half if you're not feeding a crew, like I am. 1. Heat griddle, broiler, or grill to medium high heat. 2. Mix beef, jalapenos, cheese, Worcestershire, salt and pepper in a large bowl. 3. Make 8 equal size burgers, grill 4-6 minutes on each side. 4. Top with desired toppings and wrap in lettuce or place on bun. * The original recipe calls for double the jalapenos, but my kids found these spicy enough with just the 2. Feel free to adjust for your family's taste buds! Another recipe that works for you and the whole family - always a win in my book! Let me know what your family thinks of these! You can always follow my journey on Facebook, Instagram and Pinterest ! I love to hear your stories and what's working for you!